Basically Just Print, Laminate, Cut-Up and let your kiddies Match, Sort and Sequence away…. 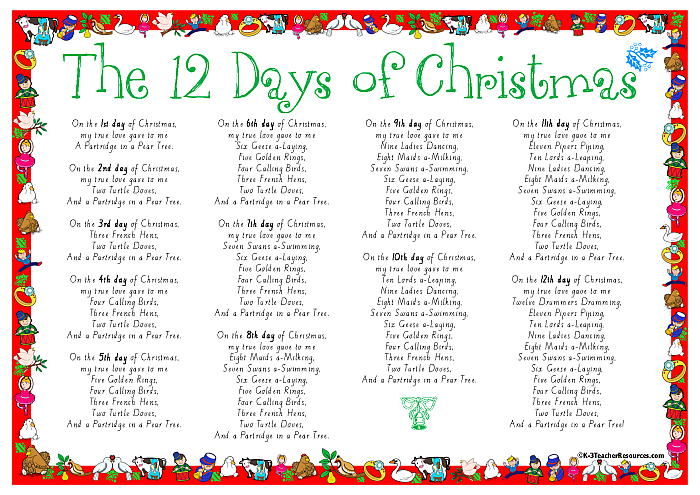 Works in well with the 12 Days of Christmas – Concept Book, and Sequencing Charts. Use these original lyrics to highlight the nouns and verbs which can be changed in their concept book, for example ‘ladies dancing’ could become ‘children skipping’. Brainstorm nouns and verbs to be used for replacement. Make a larger version whole class book first. Use as a sample for ordinal numbers, make up small copies of this printable using your printer settings so that there are 4 pages on 1 A4 sheet. Then use these as blackline masters for children to cut up, mix them up, colour in and circle, highlight letter patterns etc, then paste them back in order. Cut out the words for each day (and if you like, also cut off the picture) and paste onto bottom of A3 sheet or larger, children read and illustrate each day – make up a class big book. Glue a copy onto coloured backing board, laminate and use as class reading reference. Use whiteboard markers to find and circle all the interesting word patterns you can find. Eg. rhyming words, words with double letters, number words, etc. Find phonic groupings within these words to match with A5 Phonics Printable Cards. This is an ideal christmas carol to perform using actions.